Best Mattress For Arthritis Sufferers, Rheumatoid Pain & More! Arthritis-related joint pain affects millions of people around the world, especially older folks. Rheumatoid impedes movement, causes chronic pain, and can lead to joint swelling which makes it hard to sleep comfortably. That’s why so many older people are in pain and suffering. That’s why we went on a mission to find the best mattress for arthritis pain. Whether it’s your neck, hip, knee, lower back or just being older, you will find something that will suit your needs to make it easier sleeping at night. So, what is the best mattress for arthritis sufferers? As your bedding experts, we’ve gone hunting for the best mattresses for osteoarthritis sufferers out there today that can help alleviate your arthritis symptoms and get you back to sleeping easy. In our work, we’ve compared hundreds of cushions and ranked them in different categories on this site. For this page, we’ve focused specifically on beds that will be comfy for folks with arthritis and rheumatoid pain. We’ve come up with a short guide to shopping for beds that can give you joint pain relief, and we’ve written our own in-depth reviews of three top models that we think are worth your money. Pressure relief: Joint pain is a symptom of inflammation. If you’ve experienced swelling or inflammation, you know it’s extremely pressure-sensitive. So, if your mattress causes pressure points to build up at the hips or shoulders, that can aggravate your rheumatoid arthritis pain. You’ll need a sleeping surface which provides a layer of relief for those areas, to keep the pressure off your joints! Spinal alignment: At the same time, you don’t want to get too soft a mattress, or your spine will curve out of alignment. When that happens, your joints get crunched together, and that can be equally painful. So, under that top comfort layer, you need some firm support to keep you lined up. If you sink too deeply, you can also get stuck in one position, which will exacerbate your morning stiffness. We’ve found models with just the right balance! Personal comfort: Finally, you’ll experience different arthritis symptoms based on your own sleeping style: back, stomach, or side. We’ll help you find something that caters to your own preferences, while helping you relieve your nighttime pain symptoms especially if you’re an older person. We’ll go into more details below, in our “How To” section. For now, let’s take an in-depth look at a few of the best mattress for rheumatoid arthritis that we have right now. 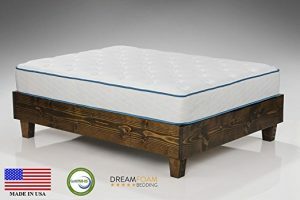 One of our most affordable, recommended, mattresses for arthritis sufferers comes from Dreamfoam. It’s a very budget-friendly bed, but it’s got great ratings for comfort and rheumatoid support from buyers. We like it because it provides a lot of bang for your buck with a 10” thickness and gel cooling features that aren’t usually included on cushions this inexpensive. So, why have we included this brand as one of the best mattress for people with arthritis? Well, you just have to keep reading to find out why. It’s an all-foam mattress and it’s specifically made for nighttime arthritis pain. It ships to you shrunk in a small box, and inflates once you open the wrapper. Buyers loved how easily they could bring it into the bedroom and get set up compared to traditional beds. The lightweight and small package are ideal for arthritis sufferers who don’t do well with heavy and bulky packages. It’s surely one of the most recommended beds for arthritis sufferers. There are three different layers of foam which provide different benefits. The base is a 6.5” block of firm support foam that keeps your spine in place and provides structure to the bed. In the middle is a 3” comfort layer which gives you pressure relief, and on top of that is a .75” pillow layer which is plush but thin. We like that the top layer is relatively shallow, so it gives you that extra bit of relief and gentle joint contact without being so deep that you sink in too far. It gets good ratings from both side and back sleepers. The relatively thick comfort layer makes this an affordable option for side sleepers, but most back sleepers said they got plenty of support too. Buyers said that while it was firm, it still felt like it hugged their hips and shoulders to provide pressure relief. Arthritis sufferers who used this one said they could sleep easy for the first time in years, and were grateful to find relief for such a low price! It has gel beads integrated into the 3” comfort layer. They help distribute body heat and keep you cool overnight. 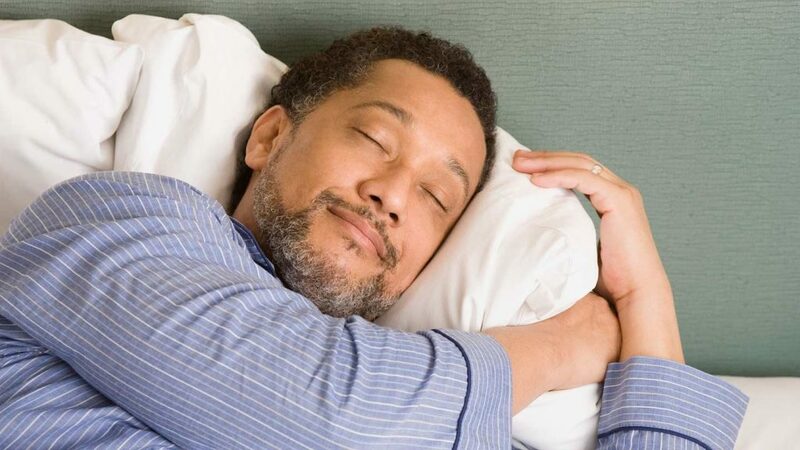 Sleepers in warm climates like Florida said that they had no issues getting to sleep and staying comfortable. That’s a big upgrade from other budget foam models! Energex foam creates a balance between the responsiveness of latex and the pressure-relieving qualities of older “visco” memory foam. It responds quickly, helping you move easily in the night, but still distributes weight very evenly. We like it for rheumatoid arthritis or hip pain because it both moves easily and gives you a bit more support than older foams. It’s made in the USA, and it’s Certi-Pur US certified to be free of harmful chemicals. The rating also indicates that a lower amount of VOC’s will be off gassed from this bed compared to the competition. Buyers said they were reassured buying this over imported budget mattresses, because they knew it was manufactured to be safe and low-emissions. It’s covered by a 10-year warranty. Some buyers weren’t thrilled with the support. According to the manufacturer, this one is considered a “medium”, but based on feedback from reviewers, we’d classify it as a medium-firm. On the other hand, the comfort layer is on the thick side of what we look for for arthritis relief, and some reviewers didn’t think there was enough backbone there. 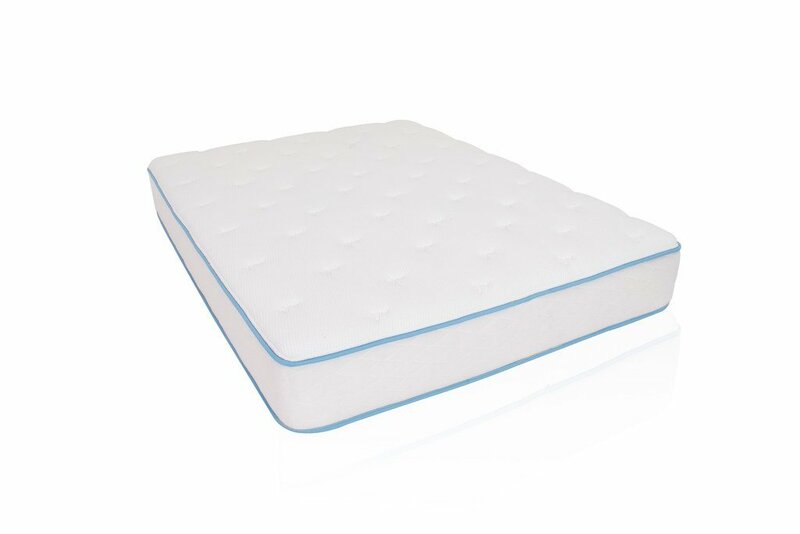 This is a good choice for people who are most comfortable with a fair amount of pressure relief, as opposed to a completely firm mattress. Some buyers found it smelly. You’ll have to let any foam bed air out for a few hours up to a full day, but some folks were disappointed that the Certi-Pur labeling didn’t mean it would be completely free of odors. It isn’t as long-lasting as other lower back pain or rheumatoid arthritis mattresses, which is to be expected for the price. A few buyers reported that the bed wasn’t quite as firm after a year or two, although many buyers found that theirs were holding up quite well. Generally, your longevity a budget bed like this will depend on your weight. Heavier folks will wear out a mattress more quickly, so it’s usually worth your buying a more expensive model up front. With that said, any issues with durability should be covered in the 10-year warranty. So, why did we consider this type of bed in our list? Well, if you are looking for the best thing for arthritis in the knees, hip, neck and lower back then you’ve found your answer right here. Well then, is this the best mattress for arthritis sufferers? The Tuft & Needle mattress, the only model from the brand, is a sensation all across the sleep market. It receives praise from just about everyone, but we think the firmer feel is ideal for arthritis sufferers. As you’ll read in the listing, it’s not quite memory foam, and not quite traditional foams, but a new hybrid that has the responsiveness of memory foam with more structure, like you’d experience on a more traditional foam mattress. We think it’s an excellent choice for most sleepers with arthritis and hip pain at night. It’s a bit firmer than the DreamFoam. This is classified as a “firm” mattress, and most buyers agreed that while it does offer pressure relief, it’s definitely on the supportive end of the spectrum. We think it’s ideal for the vast majority of arthritis sufferers, since it gives you more spinal support than the DreamFoam. You’ll never feel like you’re sinking in or having too much spinal curvature on the Tuft & Needle! The 3” comfort layer feels like memory foam in that it adapts to your body contours, but it’s designed to feel more like latex. So, it bounces back and has more responsiveness to keep you from feeling like you’re sinking. The 7” support block is heavier-duty than a lot of other foam beds out there right now, which means it holds up better over time, and for heavier sleepers. You can tell it’s higher-density, because while the mattress is the same size as the DreamFoam, it’s 10 pounds heavier! While it’s difficult to compare proprietary foams in an objective way, reviewers were very clear that whatever Tuft and Needle are doing, they’re doing right! Buyers raved about the combination of firm support and pressure relief. They said it was very supportive without being hard, and folks with hip and shoulder pain especially said the were able to sleep soundly for the first time. It’s one of the most popular mattresses on the market right now. Tuft & Needle is one of the most talked-about mattress companies out there, and they’re rated extremely well by professional testers as well as consumers. 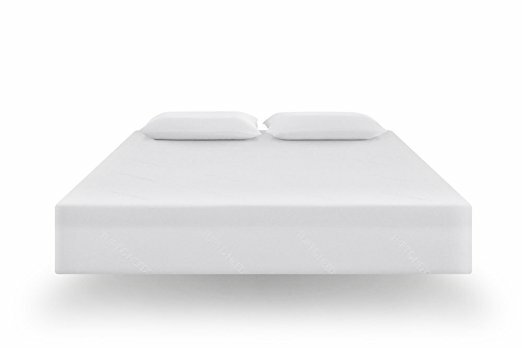 It has extremely high ratings from all sleep styles, from side to back to stomach. Popularity isn’t always an indicator of quality, but in this case, it definitely seems to be! Reviewers said it isolated motion extremely well. It’s excellent for people who sleep with a partner, since you can each get into and out of bed without disturbing the other person. That kind of motion isolation is a rarity under $1000! It sleeps cooler than the DreamFoam. That’s thanks to the integration of charcoal and cooling gel, all of which is hypoallergenic and sealed away from contact. It’s also made in the USA, CertiPur certified, and OEKO-TEX certified to be safe in both the foams and the glues used. We also love that the Tuft & Needle doesn’t use any chemical flame retardants. Instead, there’s a special fabric casing which meets fire prevention codes without off-gassing any nasty fumes. It has one of the longest comfort guarantee periods in the industry. You’ll have a full 100 days to test out your new mattress and make sure it solves your rheumatoid arthritis problem at night. There’s also a 10-year warranty. Overall, reviewers gave Tuft & Needle extremely high marks for customer service in the case that they received a slightly wonky mattress, like one that didn’t expand properly, or smelled off. Judging by the vast majority of 5 star reviews, those mishaps are very rare, but we always like to see a company step up in the service department, especially when you have an acute need like arthritis relief! You can rest easy knowing that if this isn’t the perfect fit after a month or more, you can get your money back easily. It’s more than twice the price of the DreamFoam. 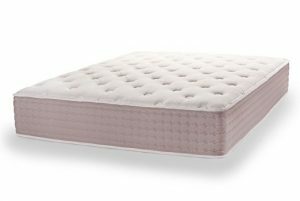 While reviewers were almost universal in praising the Tuft & Needle over other foam mattresses, it’s still a midrange choice, so it may not be accessible to all buyers On the other hand, it has much better longevity than budget options, and it receives much more consistently positive reviews. It is significantly firmer than the DreamFoam. 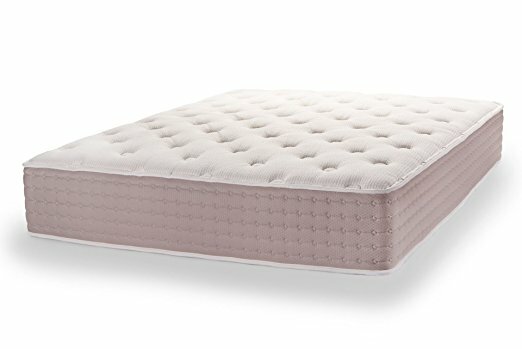 It still has a 3” layer of comfort foam, but that foam is more responsive than pillowy, and it doesn’t have the DreamFoam’s .75” pillow top layer. This may not be a good choice for all side sleepers, but most found it comfortable. If you like some extra cushion, you might consider using this with a shallow arthritis mattress topper. Unfortunately, Tuft & Needle only make one bed model, so there aren’t any comfort options to choose from. While we don’t usually think one-size-fits-all models are good for acute pain symptoms like arthritis, we’re recommending this model because of the overwhelmingly positive reviews from people who have slept on it. However it won’t be for everyone. Our top quality recommendation for sleepers with arthritis is this EcoTerra latex and spring hybrid. 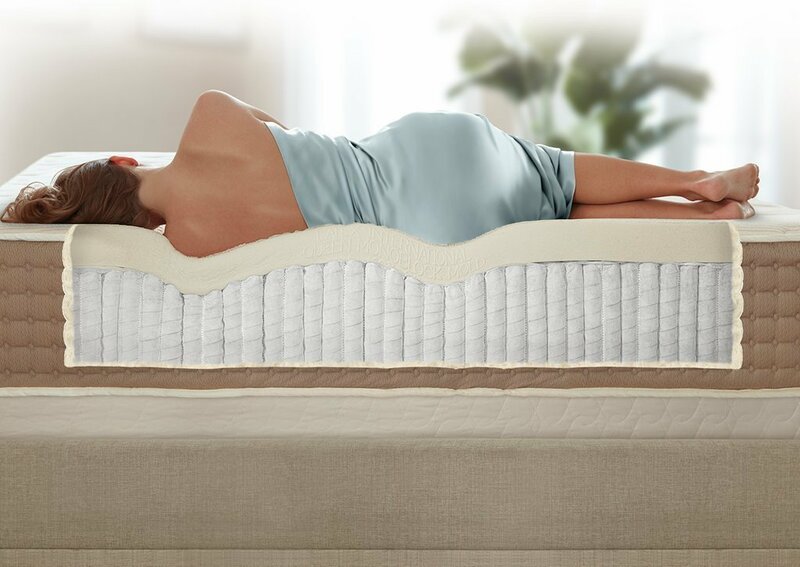 While the manufacturer describes this as a “medium” mattress, we think it lines up nicely between the softer DreamFoam and the firmer Tuft & Needle. The latex upper layer is ideal for arthritis sufferers, and the spring underbody adds excellent durability. We don’t think you can do any better, and it’s still just under $1000! It’s a good middle ground between the medium-firm DreamFoam and the quite firm Tuft & Needle. This one has a latex layer for pressure relief instead of memory foam, which adds some extra bounciness over the squishiness of memory foam. The latex top layer is extremely responsive. Latex is by far our favorite material for arthritis since it’s able to shape to your body while giving your a significant bounce factor that keeps you from sinking or feeling stuck. The latex materials used in this one also have an Oeko-Tex Standard 100 certification, so their extremely low-emissions and safer than memory foams. Like the Tuft & Needle, the Eco Terra isolates movement, so you can sleep with a partner without your movements disturbing each other. Instead of support foam, this mattress uses individually-wrapped spring coils. They can respond independently of each other to the contours of your body, which keeps movement from spreading across the bed. The spring layer is also more durable than most support foams over time. According to the company, it lasts 26% longer without developing sags. 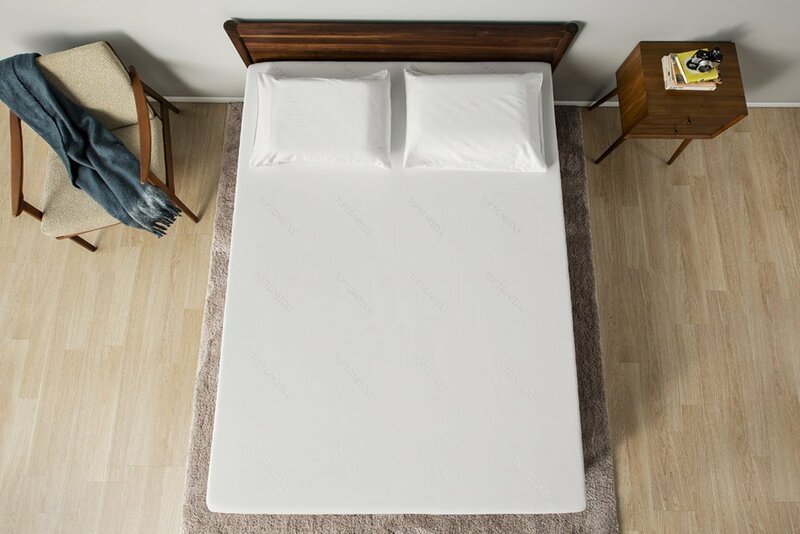 We also like that the springs provide some extra edge support, which is a weak point of all-foam mattresses like the DreamFoam and Tuft & Needle. The Eco Terra actually has slightly firmer springs at the edges, to make sure it’s not hard to get out of. That’s a big advantage for folks who have joint stiffness in the morning! Overall, reviewers scored the Eco Terra extremely highly. They found that it relieved back and hip pain in all positions. In fact, many reviewers raved about how they and their partner could sleep in different positions and be equally comfortable on this bedding. They described as supportive but supple, and flexible where it needed to be. Many buyers said that this was the first mattress that made them feel comfortable under the $3000 brand name models! While most people found the DreamFoam and Tuft & Needle perfectly safe and healthy, they’re still made from synthetic foam products, which some people can have allergic reactions to. This EcoTerra uses natural latex and green-certified fabrics which make it the most hypoallergenic of the bunch. In fact, the cotton outer layer is made with organic cotton. It’s certified by the GOTS organization. Previous buyers said it had no chemical smell out of the box, which is a big advantage of natural latex and springs over synthetic foam compounds. Like the other two mattresses, it’s made in the USA and ships to you in a conveniently rolled package. There’s a 30-day comfort guarantee, and a 15-year warranty: a full 5 years longer than the other two beds! Reviewers had very few complaints about the Eco Terra. The only complaints we discovered were that the bed is not completely free of polyurethane foam (there is a small amount used in the base, surrounding the spring coils), and that one reviewer thought the mattress built up some heat around the pressure points. To the first concern, there is only a 10% urethane content. If you’re extremely sensitive, you might find it triggering, but we couldn’t find any reviewers who were bothered by a chemical smell. To the second complaint, latex does tend to sleep warmer than gel foams, but again, the vast majority of reviewers didn’t report any issues. It’s the most expensive of the three, but quite a lot. This will cost you close to the $1000 mark. It may not be an accessible purchase for some buyers. However, it has an excellent reputation for durability, and we think it provides the best relief for arthritis pain. Arthritis sufferers should sleep on a bed that’s in the “firm” category, with lots of support and stability as opposed to cushion and pillow. The best mattresses for people with arthritis have a top comfort layer to contour around the shoulders and hips, but firm support underneath to keep the spine straight and support the joints. As you know, staying still can really amplify the stiffness and soreness you experience. So, you want your mattress to be firm enough that it’s easy to move around. That’s why you want to avoid plush memory foams. They cocoon your body, which makes it hard to get out of your indentation and move around. For many people, that cocooning means deeper sleep. For rheumatoid arthritis sufferers, it prevents you from shifting as you need to overnight. Again, aim for the firmer end of the spectrum, with just enough of a comfort layer like a pillow to contour to your hips and shoulders. As we’ve said, the trickiest balance to strike is between relieving pressure on your joints, and keeping your spine and joints supported. Instead of looking at a big, thick layer of “comfort” foam, we actually prefer mattresses that are mainly support foam or springs, with just an inch or two of comfort foam on top, possibly 3 inches if you’re a side-sleeper. Layered foam and hybrid models tend to strike the best balance for most arthritis sufferers. You’ll want to make sure your hips and shoulders can sink into the bed slightly to relieve joint pain without allowing your whole spine to curve. The easiest way to find the right balance is to actually lie on the mattress, and have someone look at your spine to make sure it’s straight. When it is, and your joints are comfortable, you’ve found the right balance! Depending on your individual symptoms, ventilation can be key to sleeping through arthritis. If a bit of reflected body heat helps your joints, you’ll probably enjoy any memory foam or latex sleeping surface. If you find that any heat buildup aggravates things, go for something with a gel layer or other ventilation technologies to help dissipate your body heat. Always buy with a generous return window and comfort guarantee! Arthritis symptoms are different for just about everyone who experiences them, so no matter how well a given mattress works for most people, you have to make sure it’s in your own personal “goldilocks” zone! That’s why we recommend buying beds from companies that offer generous return windows and extended comfort guarantees (at least 30 days) to give you a risk-free chance to try your new bed and make sure it works for you. We hope you’ve learned all you need to know to shop for the best sleep system for your arthritis symptoms! If you want to learn more about any of the beds we’ve recommended, just click on the links in the review. You can also check current prices by clicking through to Amazon! If you’re still searching, no worries! We’ve got lots more mattress reviews to help you out, and the models on this page are just a small selection of the beds we’ve examined. Head over to our homepage to see more of our overall favorite picks for comfort! Which of these mattresses will give you the best relief for your arthritis? The DreamFoam is by far the most budget friendly mattress here. We recommend it to people who can’t afford to spend a lot of money for their new bed. It gives you lots of pressure relief, and it’s higher-quality than other budget options. On the downside, it doesn’t last as long as our other recommendations, and some folks might not find it firm enough. The Tuft & Needle is our recommendation for most people, since it’s a very reasonable midrange price, and it’s extremely highly rated by a wide range of sleepers. It’s ideal for people who see the most relief with a firm mattress, especially side sleepers. On the other hand, if you need more cushion, you may want to look at the Eco Terra. The Eco Terra is the best of the three in terms of overall comfort, since it strikes a balance between support and cushion better than either of the cheaper mattresses. We recommend it to anyone who can afford it. Just know that it is quite expensive, and it doesn’t have as long a comfort guarantee as the others.